This past Monday, the New Mexico Breakfast Burrito Byway was unveiled at a press conference at Tim&apos;s Place in Albuquerque. After receiving 46,766 votes from locals about which restaurants should make the cut, the 400 restaurants nominated were whittled down to the Top 50 "Founding Members" which made their way onto the culinary trail. The full list is now live at NewMexico.org. Governor Susana Martinez was on hand to assist the state tourism secretary, Monique Jacobson, with the byway&apos;s big reveal. "There&apos;s nothing better than a New Mexico burrito to start your day off," said Governor Martinez. The Breakfast Burrito Byway is meant to help people, both tourists and locals alike, to do just that. The website lists all of the different restaurants by city, and then also provides a map which highlights all of the various locations throughout the state. Here in Albuquerque, there are 18 different restaurants that made it onto the Byway including Flying Star Cafe, Casa de Benavidez, Sadie&apos;s of New Mexico and The Range Cafe. 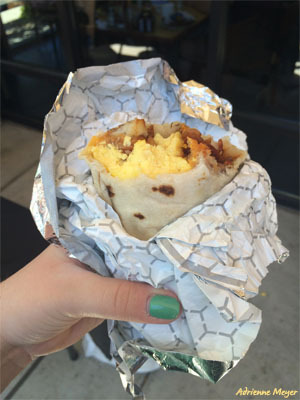 However, the different restaurants dot the state all the way from Hobbs to Farmington, making sure that hungry people all across the Land of Enchantment can get their breakfast burrito fix, no matter where they happen to be. Several different national publications have highlighted the Byway&apos;s launch including the Washington Post, LA Times, The Huffington Post, and USA Today. As such, the New Mexico Tourism Department hopes that visitors from all around the country will want to come and experience the deliciousness for themselves. In order to make sure that visitors leave with exciting memories in addition to full bellies, the website also lists neat attractions along the Byway that travelers can partake in between meals. burrito, chile, red or green?